Items available: Stick pin, tie tac, pendants, earrings and cufflinks. All items are hallmarked at the Sheffield Assay Office. Size 15mm x 12mm Presented in leatherette box. Items available: Stick pin, tie tac, pendants, earrings and cufflinks. 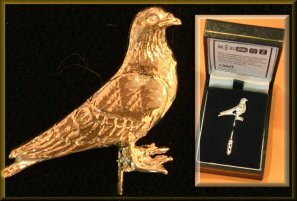 Hand crafted Pidgeon produced in sterling silver & 9ct gold. Size 20mm x 22mm Presented in leatherette box. Items available: Stick pin, tie tac, pendants and cufflinks. Hand crafted Mushroom produced in sterling silver & 9ct gold. Size 11mm x 10mm Presented in leatherette box. Items available: Stick pin, tie tac & pendant. Size 25mm x 12mm Presented in leatherette box. Hand crafted cricket ball (half round). 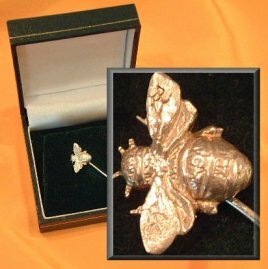 Produced in sterling silver & 9ct gold. Size 40mm x 15mm Presented in leatherette box. Items available: Pendants and broochs. Beautifully Hand crafted Bull Mastiff pendant. 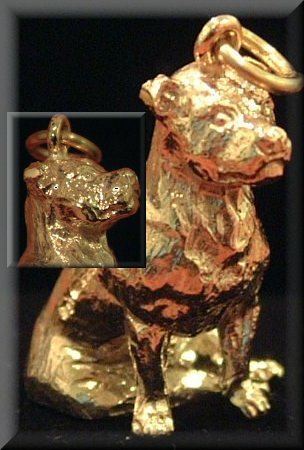 Hand crafted Bull Mastiff sitting pendant, superbley detailed. Very heavy, produced in sterling silver & 9ct gold. Size 30mm from top to bottom.